Liz shared her Snuggle Free & Clear review of these dryer sheets. In the past I have always used Bounce Free Clear dryer sheets and have never had any skin issues with my son. 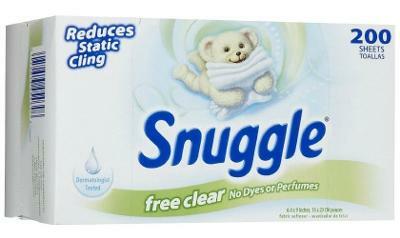 I recently bought the Snuggle brand this one time because it was on sale. I highly recommend that if you have a child with mild allergies to stay away from this stuff, I don't know what is in it, but I am throwing them in the garbage and rewashing every piece of his clothing and drying them with the Bounce Free sheets. Liz, hoping your son has a speedy recovery, and thanks so much for sharing your review of this product with me. 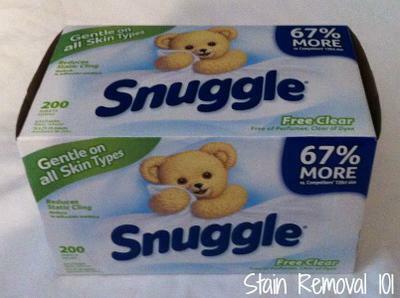 I have not personally tried the Snuggle version before, but have tried many other scent free versions of dryer sheets so it is good to hear what happened to your family when you used them. I am curious whether others have experienced these same allergy issues, or whether they've successfully used the free and clear version without incident. You can share your dryer sheets reviews here, for this or any other brand, telling me what you like (or don't) about them, and why. In addition, I understand that lots of people need to use not only hypoallergenic laundry detergent, but also fabric softeners. Thats why I've created a list of hypoallergenic fabric softeners and dryer sheets that you can reference to find the right one for you. I'll be adding a link to this review to that page so others can know about this incident you've had with it. Frances tried the liquid version of this fabric softener, but was less than impressed with it. 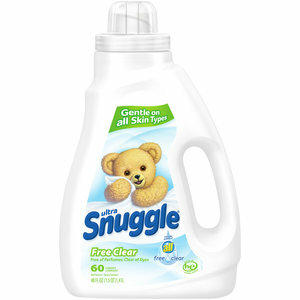 I purchased a 32oz bottle of the New Snuggle free clear liquid fabric softener and used it according to directions on the label. After my clothes were dried, as I was folding them I could smell a faint "rancid" odor. When I put on one of the garments I could still smell this odor. I went to the laundry room and opened the bottle to see if that was what was causing the odor and sure enough I could smell this same odor. I will have to go back to using the scented Snuggle or use another brand of softener that has no perfumes and dyes. I love some of the Snuggle softeners with perfumes, but not all of them, some of them are too strong. Thanks so much for sharing your review of the hypoallergenic version of Snuggle, Frances. You're the first person to share your opinions about the scent free liquid version of this product. It is not as readily available as the dryer sheets it appears, and I have not personally tried it. You can see my review of the sheets below though! Recently I was at Meijer and they were having a sale on the free and clear dryer sheets for this brand, and since I had not personally tried them I grabbed a box for testing, so I could report them to you. As you may know from reading other reviews I've written for this site, I strongly prefer to use scent and dye free products when doing laundry, since my son has allergies. Come to find out, I myself have some sensitivities to certain laundry products as well. I had used these sheets for a couple of days, and was beginning to notice a slight itch, feeling a tightness in my skin, especially where the waistband of my pants rubbed on my skin and the front of my neck and chest, where I pull the blankets up around myself. I basically ignored it for a day or two, not realizing what it was, and then putting on some hydrocortisone cream, hoping this would deal with the problem. However, after a couple more days it kept getting more and more severe, beginning to really bother my back as well, and the cream alone was not dealing with the problem. It was then I realized, duh, I was dealing with a laundry detergent allergy. One of the most popular sections of my site here discusses these allergies, and it still took me a while to figure it out for myself. I was also using a new laundry detergent at the time, Era Free & Clear, and so I immediately stopped using both, and rewashed all my clothes using Purex Free & Clear without any dryer sheets at all, adding an extra rinse. This solved the problem. No more itching, and much needed relief. It was a pain though to rewash about 5 loads of laundry because of this problem though. I cannot be totally sure that it was not the Era which was causing the allergy yet, since I have frankly been scared to try it again, sticking with the Purex for the time being. However, I have a gut feeling it was the Snuggle sheets which caused the allergy. Perhaps if I ever get the courage to finish using the jug of Era I'll update this page with the final results, but until then these dryer sheets are NOT being used again. It's too bad too, since I have a huge box of the sheets, most of which haven't been used. However, there is no way I would dry my clothes in something that caused that kind of skin irritation again. Laundry allergies are no laughing matter folks! They are horrible! Has anyone else used the (so-called) hypoallergenic version of this product? If so, I'd love to hear your reviews, good or bad. You can share your experience here or read other reviews already submitted.